Nevil's Haze - The only true haze on the market. "The only true haze on the market." An Ode To The #Kingofcannabis & Father Of Haze! 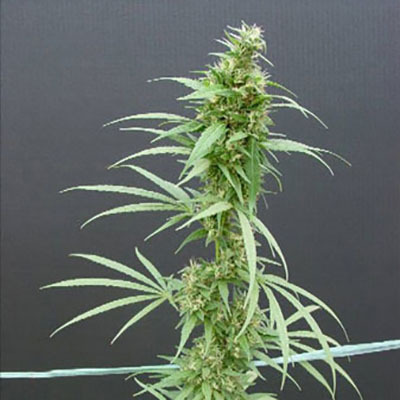 Nevil's Haze is a mostly Sativa strain with a flowering time of about 16 weeks. For Outdoors, Greenhouse or Indoor. Indoors it depends on the grower but expect 400 g/m2, outdoors and green house this can increase enormously. For the experienced growers to the most advanced cultivators. A highly valued strain from the past. Multiple Award Winner. A tribute to the father of all modern seed companies, Nevil Schoenmakers. There is something very special about this 3/4 Sativa that those in the know will recognize once they smell the end product. It can be difficult to know what to base your selective reasoning on, but the plants that go longer than 16 weeks indoor will really not be of value in the end to indoor cultivators. A tip for those who do find a long flowering plant they wish to keep. Clones usually finish 2-3 weeks quicker than the seed mother plant and therefore will give the grower a possibility to finish something that normally needs the tropics to grow in. The full flavor is sativa all the way so for you Indica lovers this plant will not be for you! It was made by combining a pure Haze to a Northern Lights #5 x Haze, thus creating probably one of the most influential plants of our time, certainly for flavor, aroma and effect. It is a must if you are within 10' of the equator for outdoor cultivation, but indoor would be recommended in other regions. Indoors you should select anything that goes up until 16 weeks flowering time and kill any others as they are not practical for indoor rooms. The north hemisphere will be difficult for this plant only southern Europe like Italy, Spain, Portugal would allow this plant to finish by December while in the southern hemisphere it will take until June. * It was during Nevil's '83/'84 collection trips to the US that he acquired, from Sandy Wienstein (who passed in 1987) the only G-13 cuttings to ever leave Sandy's garden. Nevil returned to Holland and made three crosses with G-13 at the Seed Bank. All seed companies owe the ground work and origin of modern cultivars to Nevil. Like the man himself... the legend grows! Nevil Schoenmakers (1956 - 2019), born in Australia from Dutch parents, left Australia for the Netherlands in 1976. 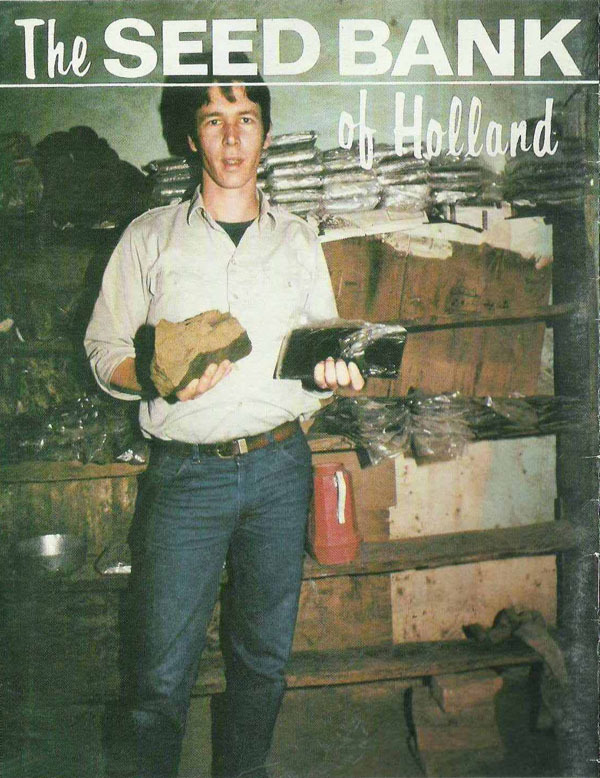 He started growing cannabis in 1978 and soon discovered that the commercially available Thai, Colombian and Nigerian equatorial strains did not perform well in the northern European climate of Holland. He started growing indoors under artificial lighting in 1979, but was not satisfied with the results using equatorial Sativas indoors. Realizing that the solution to the problem was a question of genetics, he decided that the best way to obtain good genetics was to start a seed bank and therefore he had to source and distribute premium Cannabis genetics from all across the world. The idea of breeding cannabis to suit varying conditions was fairly obvious as he had a background as a champion bird breeder, a hobby he started at just 8 years of age. The seed bank he created, then became a company that was named, 'The Seed Bank of Holland'. It was during Nevil's 83/84 collection trips to the US that he aquired, from Sandy Wienstein (who passed in 1987) the only G-13 cuttings to ever leave Sandy's garden. Nevil returned to Holland and made three crosses with G-13 at the Seed Bank. G-13 x Haze (in catolog only 1 yr, discontinued. Currently Barney's Seeds), G-13 x Hash Plant (renamed: Mr. Nice. Currently Sensi Seeds), G-13 x Skunk#1 (Last, and according to Nevil, the best of the G crosses. Currently Mr. Nice Seeds). On June 24, 1990, Nevil Schoenmakers, who legally operated the Seed Bank in Holland, was arrested by the Australian authorities at the behest of the US government while visiting family in Perth. A 44-count indictment was lodged in New Orleans, charging him with the sale of marijuana seeds to undercover agents and indoor growers in the New Orleans area in 1989. After years of legal battles, the charges were ultimately dropped. He could not be extradited from Holland as his activities were legal under Dutch law. In 1991 The Seed Bank was bought by Ben Dronkers, the founder of Sensi Seeds. Today Nevil is seen as the original father of the Cannabis seed industry and many awarded strains have been created by him and in his honour. Strains like Nevil's Haze and Nevil's Skunk, Silver Pearl, Silver Haze and many others. His work with Northern Lights, a mostly Indica strain originally developed in the Pacific North West of the United States, became the benchmark for indoor Indicas and is found in the pedigrees of nearly all of the best modern Indica lines. He is best remembered for the F1 hybrid Northern Lights #5 x Haze. This hybrid and its daughters have dominated the Cannabis Cup since the 1980s to the present day. Cuttings bred and selected by Nevil that were created in the 1980s, are still alive today and still win championship awards. It is this cross that led to many of the modern medicinal strains that are popular today. Which Nevil's Haze Is The Best? Got A #Haze Tip? Sharing Is Caring! Not a Nevil's Haze fan, or already tried this strain and want something new? If you find yourself in limbo about whether to order these Cannabis Seeds or not, please inform yourself about the laws on Medicinal Cannabis in your country. We would love to know if you have grown this variety, and especially if you we're happy with the harvest results. Go on, let us know and you could get featured here. Since you asked, the Nevilles Haze website is brought to you by Self-Hemployed and is a licensed reseller under the affliate conditions of SeedsMan and Sensi Seeds. © 2011 | NevillesHaze.com. An Ode To 'The King Of Cannabis'.